If anyone accuses Nintendo of losing its sense of playful mischief, perhaps we should just mention The Legend of Zelda: Majora's Mask. The iconic Nintendo 64 title has been teased on various occasions as potential remake material, while excitable fans have done enough speculation (and mocked up trailers) to take relatively minor hints to entirely new levels. But still, Nintendo does keep reminding us of Majora's Mask. Eiji Aonuma previously explained that it would have a minor presence in the latest 3DS Zelda release, which turned out to be cute but nothing mind-blowing, and various bigwigs in the company are vague enough in their comments on the prospect of a re-release — either 3D on 3DS or HD on Wii U — to keep everyone guessing. To remind us about it once again. Masahiro Sakurai's latest Miiverse Smash Bros. daily screen is based on the game. The image is below but so is the explanation; it's an assist trophy, not a fighter. Pic of the day. Here's a new Assist Trophy--the Skull Kid! I repeat, it's an Assist Trophy, not a new fighter. The characters announced on the website are the fighters! Nintendo keeps reminding us of this game. We don't know whether to be thankful for being pointed towards happy memories, or increasingly impatient for that darned remake that may or may not be real. But still, that screen sure is pretty. I know what your all thinking, ' what a shame he's not a playable character', right? Look on the bright side. at least we get to see him in HD. That would make him all the more creepy when he pops up as a trophy instead of just fighting. Aw c'mon Sakurai, I really want Skull Kid as a playable fighter so I could Final Smash everyone to kingdom come with the massive moon. @Einherjar It'd be even cooler, if getting him as assist trophy would affect you, too. I can't imagine anything else for him than throwing the moon at the stage, so it'd make him 1 a hella lot scarier for EVERYONE in general and 2 really difficult to use for your advantage, but if managed correctly devastating for most of your opponents. That is at least, what I think would add a bit more to the strategic aspect, Sakurai mentioned earlier with other moves/items. "At least he's in the game right?" That's what I was thinking. Anyway, I can't wait to see what new assist trophies they'll come up with. "Do you want to play with me? OK, let's play good guys and bad guys... I'll be the good guy, and you be the bad guy..."
Anyways, I'm sure we'll get Majora's Mask on 3DS sooner or later; it's not like we're asking for the moon. Perhaps early in 2015 as I assume Zelda Wii U will launch later that year. I'd like to see a Princess Hilda of Lorule costume for Zelda's character. So say I, Nomad of Nintendolife! @SkywardLink98 You don't need to be psychic to know that. At least he's in the game, so let's hope this points to a remake. I haven't played ALBW yet, can anyone tell me what the Majora's Mask tease was? The mask hanging in the shop, that's all? I'm ok with this, but skull kid would have made a cooler character than wii fit trainer. Actually the model looks very well made, considering there's obviously going to be a pretty strict polygon limit for each character in the game and particularly those that are just an assist trophy, and the textures look really nice, clean and bold to me. Maybe you're mistaking generic "current-gen" tech related effects like bump/normal-mapping [or add random name of some quickly dated looking shader effect or technique or whatever here] with actual good looking modelling and art that will actually hold up probably extremely well over time. Don't become one of those people that confuses great art and time relative/dependent "impressive" tech-effects as being the same thing. If you look at that model and think about it in terms of how good is this thing going to hold up and look in ten years time then I think it's very nice indeed. It reminds me a bit of the recent Wind Waker HD update actually, with an almost "toon-shaded" feel to it to some degree, which is a good thing. You might just have to trust me on that though. This pretty much confirms that Majora's Mask remake is confirmed. 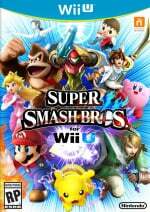 @Blastoise-san What about R.O.B in MK DS and brawl? @Blastoise-san I hope you're right! Everyone wants every character ever to be playable. Personally I rather have them focus on 30-35 characters and make them GOOD. Make sure they are fun, unique, and balanced. It adds more fun and life to the product overall. Look guys... 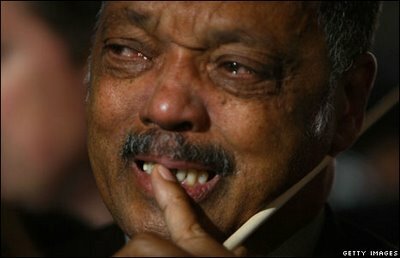 There is MONEY to be made in a Majora's Mask remake and even though I would love for it to come to 3DS.... The Wii U needs Majora's Mask. It really does. I could see people running to stores to buy Majora's Mask U for Wii U. Let's not bring the game to 3DS. The 3DS doesn't need it. It DESERVES it but it doesn't need it. Cool! So they have started to reveal assist trophy's, huh! Cries tears of joy that he is in the game, cries that he's only a assist. Ug, this talk for a remake of Major's Mask is just getting annoying. We've already had a remake on the 3DS and a remake on the Wii U. WE DO NOT NEED ANY MORE REMAKES. Just because one N64 Zelda title had a remake, doesn't mean they should do the other one. Really, they should put all their resources for a new Zelda game. I know they are working on one but they shouldn't take resources away from it just to satisfy a few fans. Those fans will be more than satisfied when a full fledged Zelda game comes out anyway. What aggravates me even more is the people here going on about "oh, remake is confirmed!" When you don't know that. All this will do is make people whine and complain more when that does not happen. There has been trophies or other material of Major's mask (or game related) in EVERY Super Smash Bros. after Majoras mask's release. Why is this one any different? Are people really getting this stupid? are you honestly sure about that? I for one honestly won't flock out for the one main reason, it'll be a remake with a some enhanced graphics that would still look similar to the N64. They have already don't a Zelda remake, why should they do more? Do you think they should just stop making new Zelda games and just remake all the old ones? I'd hope not because I want something new, and so will everyone else. An Old Zelda game will not sell as well as a new one and nor does people want just a whole bunch of remakes. People will buy one, maybe two, but if they just keep doing it, people will stop buying and will probably hurt future Zelda games as people may see it as not much new as in they lost ideas. We already see that with Mario games. People complain that it is the same thing over and over, well if they keep doing remakes like the few fans that are begging for them, Zelda will just become the franchise with nothing new but old updated games. @ikki5 I understand your point but listen to me.... Nintendo could easily let Grezzo, the guys who made Ocarina of Time 3D, to make Majora's Mask U while Nintendo focused on an entirely new game. Majora's Mask IS NOT like Wind Waker. THERE are plently of people who have NEVER played Majora's Mask. @Nomad WHAT A SHAME I OPENED MY EYES BUT THE SENTENCE NOT CHANGED AT ALL!! How amazing it would be!!! you are kidding right? More people have played majors mask than that played Wind Waker. Majors mask had sold more than Wind Waker, Majors Mask was also released on a bonus disc for the Gamecube with even more sales there. Major's mask was also in McDonald restaurants for the longest time as well as Toys R' US. Yes there are plenty who may not have played it, but if you use that as reasoning on why you should do a remake, then what about the original Zelda, I don't know many people under the age of 18 that have played that. Most people that buy that on the VC are older that played it as a kid. Same goes for The Adventures of Link. That should not warrant a remake nor should another one be made at least not for quite some time. People already say how Nintendo is nothing but old games with nothing new, we don't need more added to the fire. See everyone. Nintendo gave us Majora's Mask in HD. Better to just make him an assist. If he were made playable, then the Ghirahim and Vaati fans would complain and demand that they become playable too. Because there are too many awesome villains from Zelda! I'd take a Majora's Mask remake at some point, but i'd rather them just make NEW zelda games again. As great as it was to replay OoT and WW with enhancements, its nowhere near as excited as i was for LBW and at the moment for Zelda Wii U. I love MM and all, but i'm tired of the remakes. Give it a while and make a couple new Zeldas first, and then i'd be fine with it. @Ony Well he is just an assist, so he'll only be on screen for a few seconds, so no major reason to go all out on his design. Also this game is still in development. I'd be surprised if a Majoras Mask remake isn't already in development. Do we know what Grezzo are working on? Wtf, Nintendo? Just release a a 3D version for the 3DS and be done with it already! I have this strange feeling that instead of releasing a 3D remake of Majora's Mask they are going to make the Zelda U a Majora's Mask sequel. I for one know I wouldn't mind returning to Termina in any way, shape or form. @Blastoise-san i want ot play it, and id def get a remake of it. seems a little dark, though. id bet the moon shows up and slowly comes down and the first person to touch it gets instakilled. Just make Majora's Mask 3D already, it's a complete no-brainer. In the long run, nobody likes a tease. Not playable? Zeus darn that's a tease. I was hoping we'd see Skull Kid in this game in one form or another. I can totally dig this. So they're returning Assist Trophies? Sounds good. I wonder if Shadow will make a return, or Waluigi for that matter. @ikki5 What's wrong with a remake of Majora's Mask for the 3DS? The engine is already created and can be reused from OOT 3D, and Majora's Mask is a pretty popular game that people want to see remade. Plus what resources is it going to pull away from Nintendo? Grezzo was the main developer of OOT 3D. Outside of some help from Nintendo's development teams, what will be delayed? The main Zelda team is unlikely to be involved with this project outside of some technical support. The OOT 3D remake sold 3 million units, I think that's more than "a few fans" that were interested in that game. OOT 3D is pretty close to the numbers Skyward Sword managed to get. I think interest in a remake for Majora's Mask is a great idea. The engine is already made, and the core game is there. What's the problem with another remake for the 3DS? I don't think MM should get a full HD remake on the Wii U, but a 3DS remake would be a great way to give new life to a classic game. What if Zelda U is a sequel to MM and includes a free downloadable copy of MM: HD? Very nice. I can only imagine what his assist move will be. That would be cool, I but I kinda' doubt they would make both a SEQUEL and a remake at the same time... Lets keep hoping though. @Caryslan do you honestly want remake after remake just because the engine exists? It is already bad enough with the Mario series (not saying the series is a bad series or the games are bad) where they just shove out games on the same engine (or very similar engine) and people just complain about "rehash games". This will just make it worse. What about those people asking for a remake of a Link to the past or a remake of Twilight Princess. Or even worse now, people are wanting a 1080p HD of Skyward Sword. If they just keep making them, people will complain for the other ones and the whining will never stopped and people will go on about how Nintendo "doesn't do what fans want". Do you really think that 3 million people will continue to buy remakes? Occasionally it is good and people may buy Majoras Mask 3D, people will like it but over time, people will just stop and if will just give an even worse image to Nintendo for making rehashes and remakes. @ikki5 I agree with you, HOWEVER, I think an MM remake is well overdue. Considering that Oot got a remake in 2011, the wait is ALMOST as bad a when the games first came out. explain to me how this is "overdue" especially when there are older Zelda games being asked for a remake and we have already got 1 remake on each system. Personally, if they were going to do a remake, they should wait until their next system. There is a reason many have not played MM, it's flipping tough. I have trouble recommending it to people because of how hard and involved it gets. I DON'T want Grezzo remaking Majora's Mask. I'd rather see the actual Zelda team do it because they'll actually be able to create the atmosphere they saw when creating the original. No Grezzo on Majora's Mask. Nope. @ikki5 It's the only Zelda game with a deep story. The story itself is the best out of all Zelda games that have been made. Although I'd rather have it on the 3DS because it would make more sense. More people own a 3DS than a Wii U, and people who have played OoT 3D probably want to play the sequel. But quite frankly... I don't think anyone else CARES as much about a remake for any other loz titles. If you think about it, there aren't any other 3D loz titles TO remake. It makes no sense to remake TP or SS or the first two NES titles! So... Twilight Princess.... Skyward sword.... they don't have a deep story...? Did you play those ones? Even a link between worlds has a pretty good story though it just came out so comparing it is a bit too early. I Love TP and SS! you seem to be missing my point. Why would they REMAKE those titles so soon after they released them? MM has been out for over a decade, and the platform technology has increased significantly since its release in 2000. Therefore I think that a good remake is in order. @Hong You want LESS characters than brawl? lobviously that's not going to happen with Luigi and Toon link and most likely all or almost all clones. I'd go for quantity over quality since quality isn't an option for returning characters. But I agree for new characters. Villager and mega man are looking very well done. @citizenerased In hero mode, there's an extra secret that possibly references the three-day countdown in Majora's Mask. I encourage you to play LBW to find it for yourself, mostly because it is one Zelda no fan should miss out on. @BlatantlyHeroic Grezzo did a good job with OoT 3D. I'm not sure what you think they did wrong. sees the pic. dies. gets back to life. sees the pic again. dies. Well at least it isn't an elegy of emptiness statue. Shame he's not a playable character... but at lest he got in the game! @ikki5 Cool! Well it's been fun chatting, I'll see you on future NL posts I'm sure. Yes... except it seems the majority of the Zelda fans want to see an HD remake. I wouldn't mind a 3D remake though. Looks like she's met with a terrible fate.. to bad it's just an assist trophy. 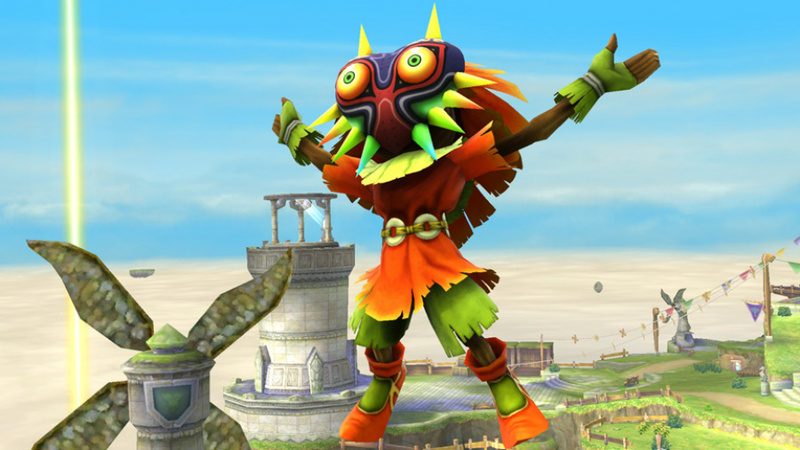 All we know is that now a high-polygon count model of a Skull Kid exists, and will appear on SSB. It may or may not be reused for, or taken from, certain N64 game that a lot of people want re-released as a 3DS game. @AlbertoC Hehe, yes please! And you're absolutely right, that's all we know for now, but at least it beats having nothing at all to speculate on! YESSS! NOW ANNOUNCE Majora's Mask for Wii U and 3DS!! Also, a NEW Majora's Mask stage or bring back Great Bay!!! also, I'd like the Eggplant Wizard to be an assist trophy. He'd be awesome as one, IMO!!! Next four assist trophies? Ridley, Geno, Bowser Jr., and Waluigi...mwahahaha! Hey, it's better than nothing right? I don't think he was even a trophy in the previous SSB games, but I might be wrong. WHO ELSE WANTS TO SEE A MAJORA'S MASK STAGE!!!! @ikki5 No their story isn't deep at all. The themes to those games are the same for mostly every other Zelda game, they do however have good storytelling, which is different. Wii Fit Trainer over this guy? Eugh. Hopeless dreams of a Majora's Mask remake, crying that Skull Kid isn't playable, people still moaning about Wii Fit Trainer... looks like it's the same on every site. Wow, gotta say, that looks absolutely beautiful! I don't know if the Skull Kid would've been a good fighter, I mean, isn't Majoras Mask too powerful? I really wish people would stop complaining about the Wii Fit Trainer. She's this games surprise character like Mr. Game and Watch & ROB were for Melee and Brawl. She adds something new to the roster, and is arguably the best rep for the Wii besides the Miis. I know people like Skull Kid, but what makes him any more deserving of getting in than Zant, Demise, Ghirahim, Vaati, Veran, or Onox? He was the main villain of a single game, and a supporting character in two other games. I think Zelda is fine with the four reps it has right now. If we were going to add in a fifth character, than why not Ganon as he appeared in the NES, SNES, and older games? That would be a far more important addition for Zelda than putting in Skull Kid or any of the other villains I listed. Plus, it would be interesting to play as Ganon in his forms from the early Zelda games. But I don't see the problem with the Wii Fit Trainer. It sounds like all the complaints that ROB got back when Brawl came out over how he did not deserve to be in the roster, and he was taking up the roster spot from someone more deserving. There is nothing wrong with the Wii Fit Trainer. Its not like she stole Skull Kid's spot on the roster. She represents both her own series, and by extension the Wii itself. What's wrong with that? Well, at least the heat is off ROB. Everyone is so focused on disliking Wii Fit Trainer, maybe ROB will get a break if he comes back in Smash 4. @Caryslan I still think that the Wii Fit Trainer is a hilarious and good fit for the game. I wasn't disappointed one bit when I saw her introduction. Now, on the other hand, if and when they announce Mii's as a playable character, that will be a waste of a character space. All because people want to play as Reggie.. that's far worse than the Wii Fit Trainer. To be completely honest, the fans that want an HD remake are mostly the ones that saw the fan-made trailer and think that Nintendo's remake would look exactly like that. And that's why I feel like those "fans" don't deserve Majora's Mask on the Wii U; they're not asking for a remake of Majora's Mask, but a REMASTERING of it, something for which the effort is better off put into a new game (which, btw, the Wii U is still getting a new Zelda game, in case some forgot). Another thing that bugs me is that fans are demanding a Majora's Mask HD, which would entail making new models for characters, NPC's, and other actors such as a torch, switch, or items, as well as new textures, most of which are already made ready for a 3DS remake from OoT3D. Why spend days creating new resources when they already exist? Aside from that, fans asked Aonuma for a 3DS remake first. For all we know, he may have even made progress on it using OoT's resources before this Wii U mess started. I've heard several people say that if Majora's Mask is made for Wii U, then they'll want an HD remake for OoT as well. N64 games will inevitably come to the Wii U, including Majora's Mask. They may even be displayed in 1080p, and that will be the Majora's Mask HD that the "fans" deserve. @Nomad that, and "come on, Nintendo, admit you're secretly remaking it for 3DS already!". I think I would rather have MM on the Wii U... 3DS would be great, but this game screams for an HD remix. Also, a MM Link that changes to the 3 different main masks then uses the Fierce Deity mask for an Ultimate smash would be sick. Wasn't disappointed, I'm glad to finally see an assist trophy. An assist trophy may just mean that they are finally developing a little further in the main details of this game. But not saying they still don't have a while to go, because they do. I'm so anxious to see what new fighters and assist trophies lie ahead. I never played Majora's Mask so I'd definitely pick it up if they remade it for the 3DS. Just because a remake isn't necessary doesn't mean it shouldn't happen, especially if it can sell like OOT did if not better. At the end of the day Nintendo is going to look at the profit they can make. Ok...how about Black Shadow, Masked Man, Waluigi, Birdo, Nightmare/Yoshimitsu, and/or Bomberman, then, since my beloved Skull Kid is not worthy of the Smash roster.? !